Have you been thinking about starting a blog, but you’re not sure how to get started? Well, stop thinking about it and do it. If you’re like me, though, you need a few steps to get started so here are five to move you forward. Choose your topic. You can write about anything you want to write about but if you want a following try to narrow your focus. I started my blog as a way to communicate with members of National Federation of Press Women. I’m exposed to lots of information through conferences, training, list serves and business books, and I realized I could distill the nuggets from these sources so that others wouldn’t have to do the research. That’s my blog – Cynthia’s Communique. Choose a platform. I set up mine on WordPress because at the time that is what I was most familiar. I also like how easy it is for readers to post comments. Another platform is Tumblr, which is especially nice for short posts and photos. A colleague once described it as long-form Twitter. Whatever, you choose, take the time to read or watch the tutorials. Create a content calendar. How often will you publish? Where will you find inspiration? I post every Wednesday and Sunday – it’s what works for me. During NFPW conferences, I post daily for the members who can’t attend. You may decide to post simply when you feel like it. A downside to that is that it’s challenging to grow your readership when readers don’t know when to expect a post. I also keep a running list of ideas. I note key holidays and events that might be relevant for a blog topic. Sometimes I’m able to create evergreen posts that don’t have a time limit but I can use when I might be too busy. These are especially helpful for when I’m traveling and may not have the extra time needed to write a post. My content calendar is always with me so I can tweak it, rearrange it, add to it. Write your blog. And then proof it and edit it. Even after you do that, you may post a mistake. Own up to it and correct it. My blog is usually a few hundred words. To get to those words, I often spend an hour or two researching my topic, interviewing people, distilling information and then putting the salient points on paper (well, on the screen). It’s a lot of work, and I must carve out time to do it. Be prepared to put in the prep work. Market your blog. You can write a blog and post it, but that doesn’t mean anyone will see it to read it. It’s not like a baseball field in an Iowa cornfield. You need to employ SEO (search engine optimization or key words). You need to print it on your business card. You need to tweet it. You need to share it on Facebook. You need to talk about it. You should also read other blogs and write a comment if you have something relevant to share. You should link to other blogs and materials in your blog so that your readers know they’re getting something more than simply your thoughts. These steps will move you forward. You’ll keep learning along the way, just as we all do. When you launch your blog, I hope you will send me a link so I can check it out. Schools.com created this infographic about how social media is replacing traditional journalism as a news source. I still subscribe to the daily newspaper. I enjoy reading local news and getting an in-depth look at trending topics. When it comes to getting breaking news, though, I often learn the latest on a social media site. Stories such as the Hudson River plane landing and Whitney Houston’s death broke on Twitter before they did in traditional media. However, even when I learn of a breaking story on social media, I still need to have it confirmed by a traditional source before I believe it. That’s mainly because I’m not convinced that those who are reporting on social media sites understand news values and, more importantly, ethical news values. Accuracy: Journalists need to put what they report in context. They also need to use the correct facts. Confirmation: A news article needs to withstand scrutiny inside and outside the newsroom, write Philip Patterson and Lee Wilkins in Media Ethics: Issues & Cases. The Washington Post coverage of Watergate is a classic example of stories withstanding scrutiny. Sufficiency: Adequate resources need to be allocated to important issues. Unfortunately, with staff cutbacks, many news organizations aren’t able to do this. Reporters also should thoroughly review materials before publishing. Our news sources may be changing, but the ethical news values should remain the same. One of the best pieces of time management I’ve ever heard is to do the most important thing first. I’ve also heard that you should complete the task that you dread the most. Often, they are one and the same. For example, I thoroughly enjoy writing this blog. However, to succeed at it, I need to carve time to develop topics and research them. When I don’t do that, I’m left at day’s end realizing the clock is ticking, and I still haven’t written my blog. Today is one such day. I spent a few hours developing ideas, and I’m really excited to work on those topics, which will come later this summer as they’re tied around specific dates or the upcoming NFPW conference. However, what I really needed to do today is write today’s blog. It’s now after 6 p.m., and it hit me that I should have written today’s blog first and then done research for additional topics. The same holds true at work. Fortunately, I’m more successful in the office. I write down three things each morning that I must complete that day. I spend as much time as possible working on the first one. Then I invariably have a series of meetings. When I next have a chunk of time, I finish the first item before moving to the next one. I don’t always succeed in finishing all three, but then I simply put the one or two that do not get finished at the start of the next day’s list. The items often involve planning and strategizing for some event, meeting or report that won’t even happen for a few weeks. Yet, I know that is where I need to spend my time. The key is to remain focused on the most critical assignments. How do you spend your time? Last night at volleyball we were up by five points with two minutes left on the clock. Suddenly everyone was feeling the pressure, and we started rushing to serve and keep the lead. And then it hit me. We have the lead. Slow down. Let time work for us. We didn’t run after the ball when the other team hit it out of bounds. We retrieved it, and passed it back to our server at a reasonable pace. More seconds ticked off the clock. We served. The ball came back. We used our three hits; we scored the point. The ball came for the next serve. We watched as the ball slowly made its way to the server. Tick, tick, tick. Only a few seconds left. We served, they returned, the buzzer sounded announcing time was up, we returned the ball and scored. Game over. I thought about that as I was driving home. All we needed to do to win the match was to stick with the plan and play our game. We didn’t need to rush. I need to remember that in my life. I have a plan for what I need to achieve at work. I know what I need to do for my fitness, for my house, for my friends. I don’t need to rush. I need to work my plan. Sometimes that means slowing down. Does time work for you or against you? When is the last time you learned a new word? Like many in my region of the country, I learned a new one this past week thanks to the horrible storm known as a derecho. 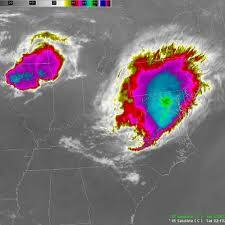 This storm is a widespread, long-lived wind storm that can produce destruction similar to that of tornadoes. The damage typically is directed in one direction along a relatively straight swath. As a result, the term ‘straight-line wind damage’ sometimes is used to describe derecho damage. When I realized this word was new to me, I started thinking about how I learn new words. I used to love Reader’s Digest for its “Word Play,” which is a quiz that improves vocabulary. When I read a book in high school and college, I always took the time to look up words I didn’t know. Unfortunately, when I read now, I often skim over the word. When did I get so lazy? The question hit me when I was in a shop and came upon a little book called 100 Words Every High School Graduate Should Know. Of course, I couldn’t resist purchasing it. I was familiar with most of the words, but discovered that a few of them I was using incorrectly. Yikes! The book not only provided me with the definition but included examples of usage and history of the word. At the end of the book are exercises to improve vocabulary. Of course, one is to write down the words I don’t know and look them up. My favorite, though, is to create a list of words that I think people should know if they were to learn more about a topic that interests me. I thought I might apply that to my day job. Such a list would be beneficial to new employees.